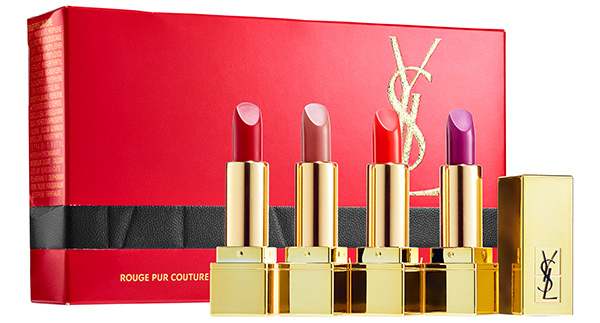 Yves Saint Laurent Rouge Pur Couture Mini Collection for Holiday 2015 | Top Beauty Blog in the Philippines covering Makeup Reviews, Swatches, Skincare and More! Spread the love this holiday season with The Mini Collection, a luxury beauty set featuring mini Rouge Pur Couture lipsticks in four iconic shades: Le Rouge #1, Le Orange #13, Le Fuchsia #19, and Le Nu #70 — ranging from brilliant red to vibrant fuschia. Glide on luxurious, rich color that envelops the lips with intense hydration and antioxidant care. Encased in signature, couture jewel-like packaging, Rouge Pur Couture delivers edgy style and ultimate feminine look. This is a lipstick that I really want to try. Collezione super e colori ancor di più! So gorgeous, really want these! My favourite is the purple shade. Stunning lipsticks! <3 Thank you for the kind comment on my blog, always trying to return the support! Wow ... This is such a gorgeous set.